What Does Waiting Look Like to You? Each week, I eagerly await the WordPress Weekly Photo Challenge that asks bloggers to share appropriate images based on that week’s theme. 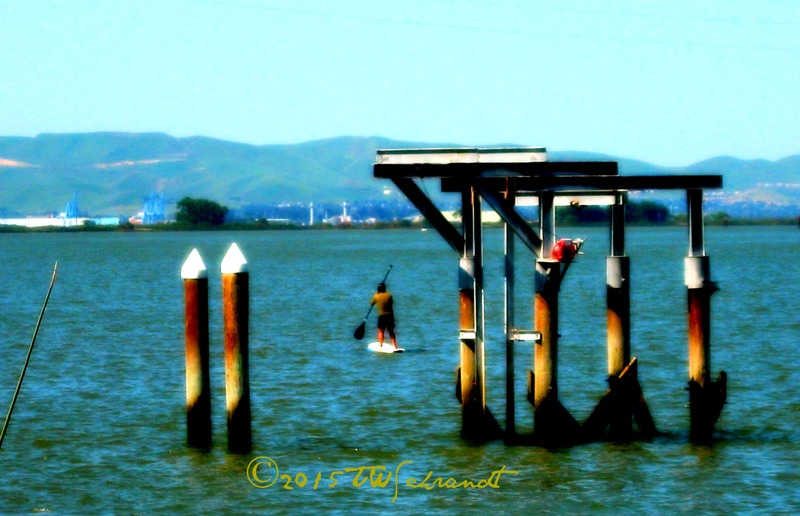 As I anticipate my last weekend at the Sacramento River delta, I keenly recall animated conversations during the late winter and early spring of how we were going to spend every weekend windsurfing. “Best laid plans” and how quickly time flies! While we anxiously waited and dreamed of our new season, I am sharing some older photos that have been waiting to see the light of day and work for the theme of windsurfing and Waiting. 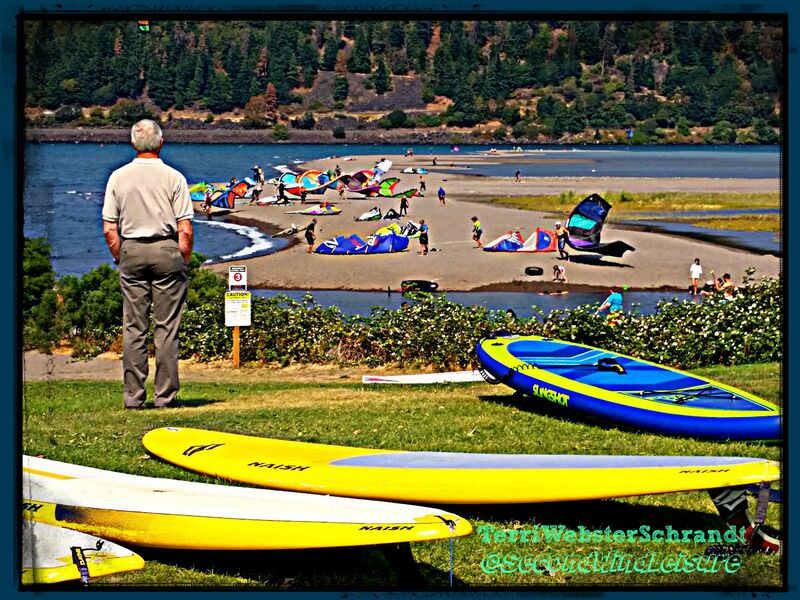 Almost two years ago to the day, I posted this image of a man observing the windsurfers and kiteboarders waiting for wind. This photo taken by my husband (with my phone) illustrates the wait and the fear involved in ocean windsurfing. 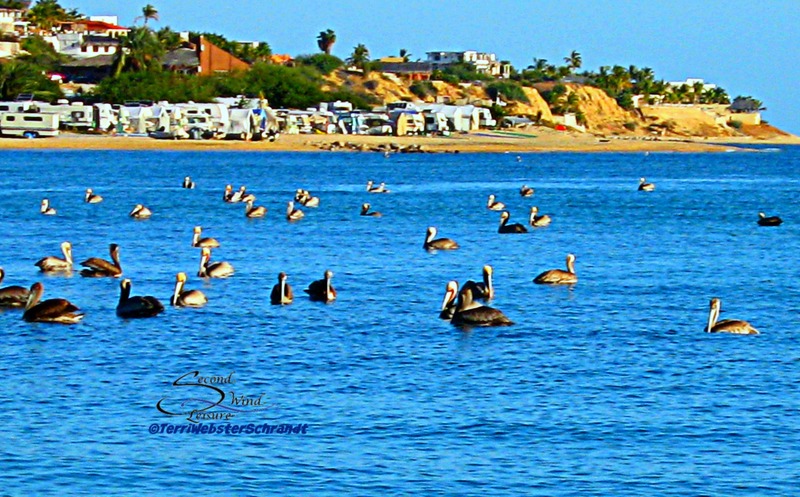 While campers wait for the late morning winds, pelicans wait for their breakfast in La Ventana, Mexico, a winter windsurf venue. Smart windsurfers use their non-windy times wisely by enjoying a SUP session. Morning SUP session while waiting for the wind. Hubby and some friends love their weekly cigar after a weekend on the water. 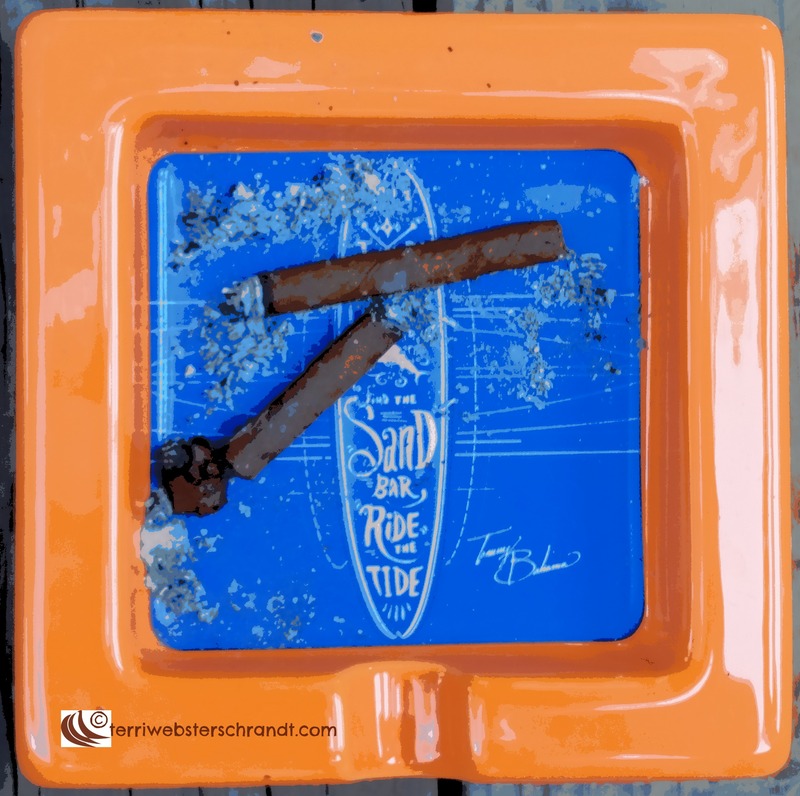 I included this because of the surf motif of the ashtray. This is a very enjoyable post as usually waiting is a boring to totally unpleasant activity. You showed us another side and showed how waiting can be anticipation of something wonderful. In fact I waited on the phone today for about 30 minutes more than I should have had to while I was transferred from one department to another. The last person told me I wasn’t even in the correct place, and me, I’m at the mercy of people forwarding me via phone. Ugh! Thanks, Sharon, I hate waiting and phone waiting is the worst! Hope you got it ironed out! I feel ya, Sally, thanks for sharing! Hahaha, Hugh, now why am I not surprised? How timely to have discovered your Blog. I am currently awaiting the arrival of Irma in South Florida. Luckily for me, the track shifted yesterday and the East Coast catastrophe that would have engulfed my home has now moved to the West Coast and will most likely be devastating to much of that coast. As you might imagine, we have done our fair share of waiting these past few days.Looking forward to reading more of your posts and will return soon. Hi Suzanne, thanks for following and I’m glad to hear you are out of harm’s way! Can’t imagine waiting out these storms and wondering what will happen next. Brilliant post as usual, Terri. You’ve made me think about photos I’ve taken that represent waiting and just this week I took a picture of my 5 yo grandson while he was waiting for the bus to take him to kindergarten. Your photos are all terrific and I loved the way you worked the cigars into the them, which reminded me I have not had my annual summer cigar. Guess I’d better add that to my list before it’s too late! Aww, thanks, Molly…your annual summer cigar?? Do tell, lol! Very good examples of ‘waiting’ and the quote is excellent. I am fine with waiting for things that I have planned or that depend on me to happen. There is the in-between activities type of waiting time, and there I again have patience by reading, observing, playing with my phone, etc. However, if I’m waiting for someone who is very late and doesn’t call but forgets to cancel appointments, or was supposed to do something and didn’t, my patience is gone. Those are some incredible photos perfect for this WP challenge, Terri. I guess soon, you will be waiting again for summer to come around and head back to the Delta every weekend! 🙂 I, personally, hate waiting. I do find it a waste of time and the older I get, the more precious that time becomes. But, being able to slow down and see waiting for something is “extra” or “free” time might be better for our general well-being, bodies and minds. Thank you! Very wise words, Liesbet! 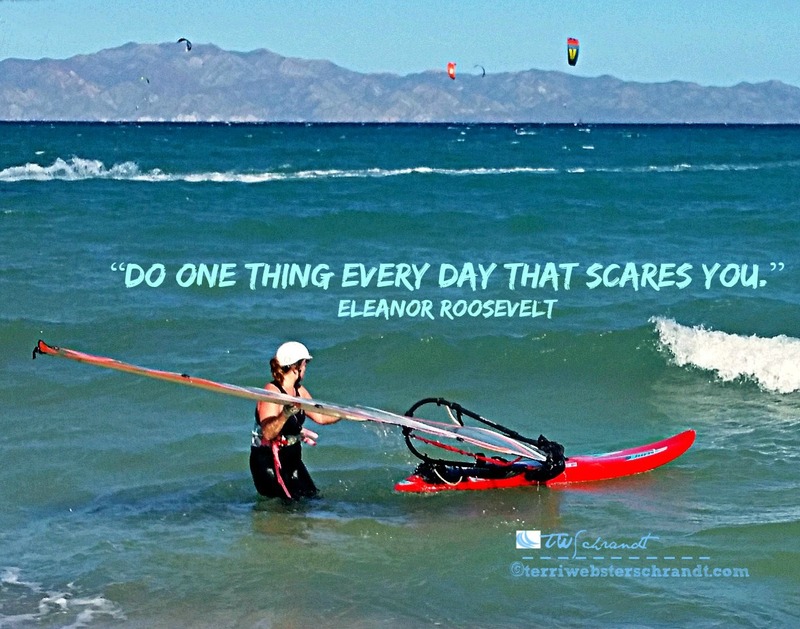 LOL on your quote and kudos for accomplishing your goals re the windsurfing challenge!! I am really enjoying seeing these great photographs about windsurfing. I feel that I am learning a lot about your hobby from these posts. As I read your post, I am listening to an NPR news story about Floridians waiting for Irma. Your beautiful, calm pictures stand in contrast to the waiting happening on the lower part of the East coast. I love that last quote… how true! It is so sad to watch fellow Americans endure hurricanes and fires, and that wait for gas, word of evacuation, or a shelter must be beyond horrible. I agree with Jodi — ‘Waiting’ is a very intriguing category. You have captured it incredibly well. Love the photos and the quotes. My patience in waiting usually depends on what I am waiting for! Thanks, Donna! I try to have things to do while waiting, or waiting in line. Such an interesting category, Terri! I am terrible about waiting so it would probably look like a mass of craziness!